Perhaps you’ve spent the last few days of your Queenstown holiday bungy jumping, mountain bike riding, skiing, white water rafting and horseback riding and you can feel it in every single one of your aching muscles. Maybe you’re stressed out from a recent unenjoyable meeting on a business trip – whatever the reason, you need some relaxation and you need it NOW! Thankfully, Queenstown can cater to all of your needs with an indulgent experience that will have you on cloud nine in no time at all. There’s so much that can be said about the amazing Onsen Hot Pools, but one word sufficiently gets the point across… perfect! Firstly, the water used in these private hot tub style pools is a mixture of rainwater, spring water and lake water, which is endlessly purified using (O²), which temporarily forms Ozone (O³). This has a cleaning power that’s 1000 times stronger than chlorine but is completely chemical free and converts back to Oxygen within seconds. The water is also replaced constantly with fresh water, which is heated in a sustainable manner and recycled for garden watering and toilet flushing after its last use. The baths are each located in their own private cedar-lined rooms and each contains a shower and change area. 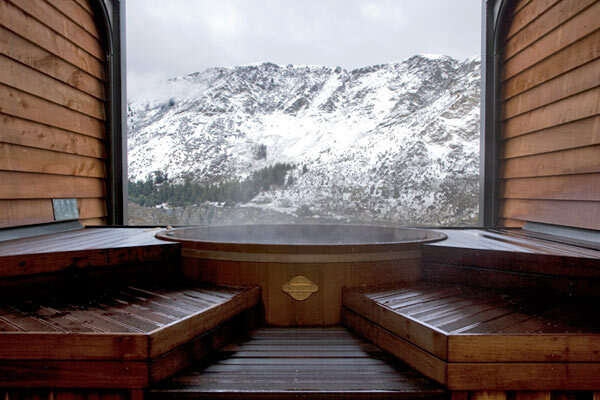 Once you’ve stepped foot into your warm and relaxing hot pool, you will sit in awe of the stunning mountain view from the slatted wall-length windows, but that’s only if you don’t want to invite the view into the cabin with you! At the click of a button, you can truly experience the sheer wonder and reverence for the view, because the entire view-facing side of your cabin will retract upwards, allowing you to have nothing between you, the scenery and the refreshing mountain air. Even better, the wall actually also retracts past the roofline, meaning you can have one whole side, plus the roof, completely open to the surrounding natural environment! This is particularly mesmerising at night time, when the bright night sky creates the perfect romantic backdrop. A night time package, you’ll be surrounded in pure comfort and luxury with candles flickering in the cool mountain air, the stars twinkling above and the quiet tranquillity of the dimly-lit mountain scenery. For couples, you’ll receive two large, fluffy towels, two flutes of sparkling wine, a bowl of delicious strawberries, a bottle of mineral water and an aromatherapy oil burner filled with a truly indulgent scent. Another couples package, you’ll receive two huge soft towels, two Phoenix brand organic soft drinks, a delectable bar of chocolate and an aromatherapy oil burner with a pampering scent that will help you relax. Onsen Hot Pools are simply pure Indulgence, Queenstown style! Another luxurious option for those that want more than just relaxation in a spa is the Body Sanctum Day Spa Massage Centre. This centre has a beautiful setting and atmosphere too (albeit, primarily indoors), and the range of pampering options available is outstanding. Using either warm oils or Body Sanctum’s own organic range of massage wax and hot towels, you can opt for either the relaxing Swedish Tranquillity Massage, a Deep Tissue Sports Massage, an amazing sensory Aromatherapy Massage, a relieving Maternity Massage or a Side-by-Side Couples Massage, which is designed for couples or friends. You can also opt for the highly therapeutic Reflexology Retreat foot massage or the amazing Indian Head Massage. For a totally indulgent body wrap, facial, manicure or pedicure, you cannot beat Body Sanctum. Options include a full body Fiji Island Wrap (1.5 Hours) which includes a body scrub, coconut oil treatment, full body, face and scalp wrap, as well as the use of hot stones. A 45 minute Tropical Island Body Glow gives your whole body a baby-smooth exfoliating shine, while the Essential Facial (45 mins) is a classic facial customised to your skin type. Then there’s the Wellness Facial (1 hr), Ultimate Facial (75 mins), Essentials Manicure (45 mins) and the Essentials Pedicure (45 mins) for an absolutely amazing day. The Body Sanctum also offers luxurious spa packages for groups or individuals and these are ideal for special occasions. You can include lunch and champagne in these packages if you desire. After a morning indulging at the Body Sanctum with a full body massage, followed by either a foot revival experience or a wonderful spa facial, you’ll be whisked off to the Queenstown Wine Trail, for an indulgent Summer Sampler wine tour. With tastings at two wineries and gourmet food to enjoy, you’ll then take a tour of an amazing underground wine cave before ending your trip at a cheesery.